The first time I picked up a cast iron pan, I was seriously intimidated. I was exploring my passion for food through teaching myself to cook, and all I had was questions. What am I supposed to do with this heavy thing? It’s so intense, will it burn my food? What should I use it for? What shouldn’t I use it for? Wait, aren’t these things really hard to clean? Years later, after completing culinary school and cooking hundreds (if not thousands) of meals as a professional chef, cast iron no longer scares me. I’m in love with my cast iron cookware. In fact, if I’m stranded on a desert island and I have a cast iron pan, I know that I’ll be okay. There may be lighter weight, non-stick alternatives available on the market, but nothing beats the power of cast iron. So set aside your apprehension and let’s answer some common questions about these pans. Cast iron is ideal for frying and baking because it holds heat much longer than aluminum pans. The food in contact with the pan will sear nicely, while the food above it will cook through radiant heat. This is possible because of the high melting point of the cast iron material. To make the pans, manufacturers have to heat cast iron to over 2,200° F! It’s worth noting that it is a myth that cast iron pans will heat evenly. Hot spots develop wherever the pan is in contact with the flame. This won't cause many problems if you're frying in shallow oil, but I like to rotate my pan while preheating if I'm searing meats or vegetables. This helps create even heating throughout the pan, so the whole pan comes into contact with the gas flame. If I'm feeling lazy, sometimes I’ll throw the pan in a hot oven, then I’ll transfer it to the stovetop once it's hot to start cooking. Will it burn my food? Yes, any pan can burn your food, but the beauty of cast iron comes from the seasoning. Seasoning refers to the protective coating created by heating thin layers of oil on the pan's surface. Well-seasoned cast iron cookware should be perfectly non-stick, and this means you’re less likely to burn food to the bottom of the pan. If you use your cast iron a lot, this seasoning continues to develop in layers, improving that non-stick surface. While nothing beats a nonstick frying pan for cooking over-easy or scrambled eggs, I feel confident enough to use my cast iron to make a crispy fried egg (which, if you haven't tried it, is completely amazing and transformative). Caramelized endive on my favorite chapa-style round griddle. 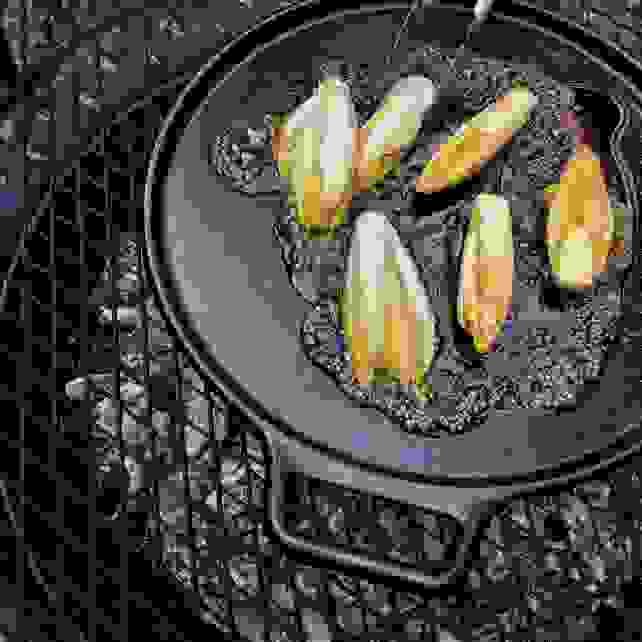 Fire up the firepit and get cooking with cast iron! Is it hard to clean and maintain? Nope, here’s another myth dispelled. My mother would tell me to never take soap to cast iron, but I’ve cleaned mine with soapy water plenty of times. The thing you don’t want to do is let it soak in water, as soaking can cause rust. Most of the time, I’ll just brush the pan out after use. Sometimes I'll clean it by boiling some water and lightly scraping the cooked bits off with a spatula. If it’s really soiled, I’ll wash it with soap. 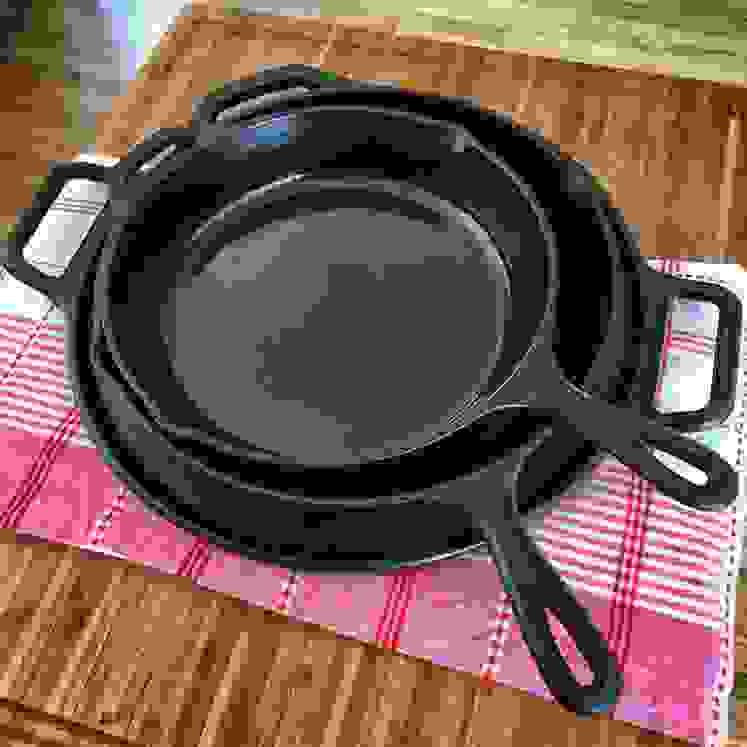 The most important thing in caring for cast iron is to dry it well and keep it seasoned by rubbing some canola or vegetable oil over the hot surface with a paper towel. Really, the best way to keep it seasoned is to use it on a regular basis. The more you cook with it, the better your seasoning will become. So what are you thinking, ready to jump in and get cooking?